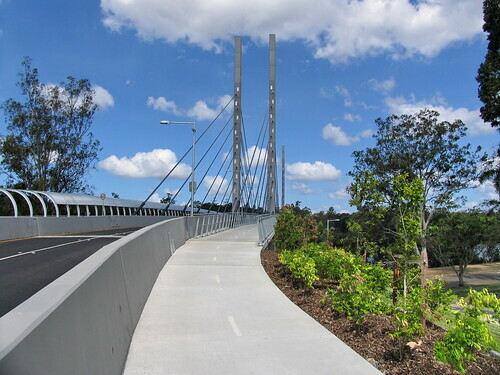 In response to the previous post proposing that the Long Bridge expansion project be conceptualized as a DC area "Green Bridge" devoted to sustainable modes, our NZ e-correspondent Nigel calls our attention to the Eleanor Schonell Bus Bridge in Brisbane, Australia, which is a "green bridge" serving bus traffic, pedestrians and cyclists ("At last, a public transport bridge," Brisbane Institute). This Schonell Bridge opened about a decade earlier than the Portland bridge, although it's shorter and doesn't support as many modes as Tilikum Crossing. 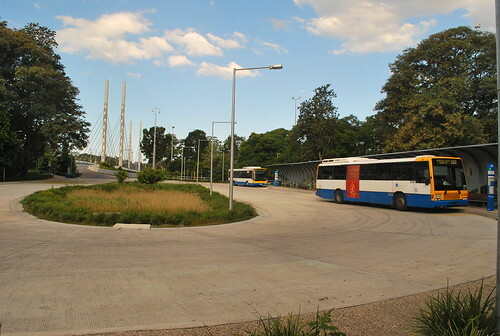 In terms of constrained vision and/or design, Nigel points out that the bridge access is truncated on the University of Queensland St. Lucia side of the bridge, where there is a cul-de-sac, so that buses turn around and return to the Eastern Busway. Cross-bus traffic via the bridge, connecting to other parts of the transit network, is not possible. This is not atypical. In the US, some universities have been known for their opposition to adjacent transit lines (the case at some point for University of Southern California, University of Maryland College Park, and Virginia State University in Norfolk, Virginia). 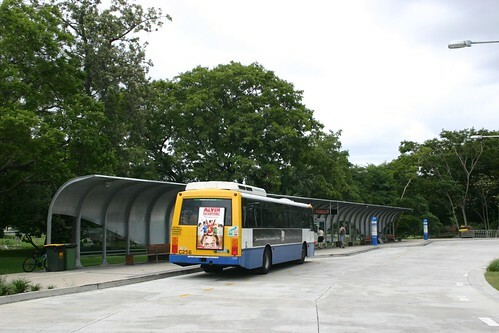 The University of Queensland mandated the cul-de-sac so that there wouldn't be a bus way across the campus ("UQ Senate sets out conditions for the construction of BCC green bridge," UQ News), connecting to the town of St. Lucia or to the eastern busway. The bridge replaced a ferry system and provides greater capacity. Because of demand more frequent service and new bus lines have been added to serve the campus. Taxis are forbidden from using the bridge, based on the agreement with the university. Interestingly, USC, UMD-CP, and VSU now favor rail transit. And so does the University of Queensland, because of their experience with how the green bridge changed mobility practices for their campus. 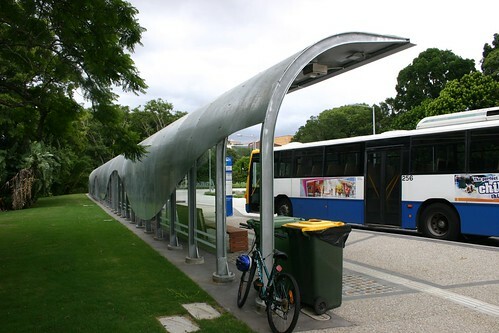 According to the Brisbane Times ("Council anger as UQ plans new bridge to west end") since the "green bridge" was opened and with various improvements to transit service for the campus, now a majority of trips to and from the campus are made sustainably. The university aims to service growth in enrollments and activity through even greater transit connectivity. 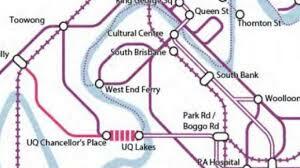 The new campus master plan aims to build on this change by (1) building a tunnel to connect the UQ Lakes bus station at the Green Bridge to the cross-campus UQ Chancellor's Place Bus Station and (2) adding a second bridge crossing, with it having the capacity for rail transit as well. The underground tunnel makes the link between the green bridge and the west side of the campus, which had been forbidden by the original agreement. The underground connection satisfies concerns about the conflicts that likely would develop on the surface between pedestrians and vehicles and the sheer number of buses likely to travel across the campus. Sometimes, it takes the experience of transit working to build the demand and support for more transit. Although this is a more expensive and much longer way to bring it about.